As both a filmmaker and martial artist, there are few modern movies that I regard as highly as Ang Lee's masterful Crouching Tiger, Hidden Dragon. So when Harvey Weinstein first proposed the idea of revisiting the franchise, I said that I had no interest in writing a straight-up sequel to such a beloved and groundbreaking classic. As it turned out, neither did Harvey. What Harvey wished to explore -- and what I soon found to be a captivating idea -- was to return to the obscure literary source that inspired the 2000 film: The work of Chinese writer Wang Dulu and his Crane-Iron pentalogy. Little-known outside of China, and mostly forgotten in its homeland, the Crane-Iron stories are a five-part fantasy series that chronicle four generations of martial heroes. With titles such as Precious Sword, Golden Hairpin (Book Two) and Sword Force, Pearl Shine (Book three), the fourth book, Crouching Tiger, Hidden Dragon, was the basis for the Ang Lee film, although Lee also drew key elements from the first three. The fifth and final book, Iron Knight, Silver Vase had never been adapted and stood as a forgotten final chapter to a pentalogy that introduced a new generation of star-crossed lovers and Wuxia heroes. Although few know the name Wang Dulu, he well deserves to be remembered as a writer who perfected the Wuxia genre, paving the way for the fantasy literature that would inspire martial arts cinema as we know it. The opportunity to revisit Wang's epic story-world and create more of a stand-alone treatment of the final book rather than a sequel to the classic film was intriguing -- not just to Harvey and myself, but to Master Yuen Woo-Ping. Hong Kong films that inspired Ang Lee to create Crouching Tiger, viewed it as an opportunity to direct his own Crane-Iron tale. While Lee's film has been deservedly hailed as an artistic drama with kung fu -- "Sense and Sensibility with martial arts" some have called it -- Master Yuen embraced the opportunity to adapt the final Crane-Iron book in the pure, Wuxia action style he is known for. 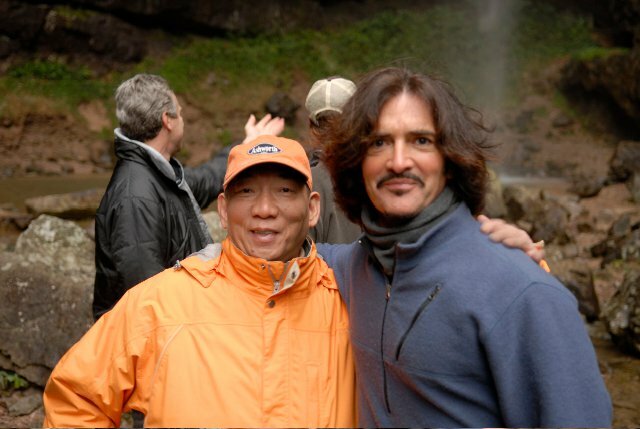 With over 70 film credits, Yuen Woo-Ping began as a fight choreographer in the early '70s and directed his first actioners in '78, helming two movies with the young Jackie Chan: Snake in the Eagle's Shadow and Drunken Master. He would go on to direct and influence the careers of such action stars as Sammo Hung, Yuen Biao, Jet Li, and Michelle Yeoh. This venerated lineage was not lost on the Wachowski's who sought out Yuen in 1999 for The Matrix, or on Quentin Tarantino who would enlist the master's choreography for his Kill Bill films. As a director, Yuen Woo-Ping knows the Wuxia vernacular like few others. He essentially created the dance-like, gravity-defying, fighting-in-tree-tops style that has become synonymous with Crouching Tiger. Yet it's a traditional language that found its form in the written works of modern Wuxia writers like Jin Yong, Liang Yusheng, and Wang Dulu. For me, Sword of Destiny has been a journey back to the source. Not just to the unsung literary roots of martial arts cinema, but into the workshop of one of the genre's pioneers, an iconic action directer who is comfortably at home honoring and celebrating those roots, even as he continually ups his game. I think the late Wang Dulu would have been pleased to see his final Crane-Iron story, the lost chapter, come to life in the hands of a director who truly lives and breathes the world of pure Wuxia.